Who isn´t fascinated by Leopard. Less is more........., BUT a little Leo is always great! I can´t help but being fascinated whenever I see a nice leo print, whether it´s on a shoe, a bag or a coat. Since the first time I tried on one of my Grandma´s leopard printed shirt 40 years ago, I have been loving the animal print. Just make sure to mix it with something very simple, whether it´s in interior or fashion, and you will be able to get away with it, without making it look eccentric. The keyword here is SIMPLE ! Me, on a lovely autumn day in Paris wearing one of my favourite coats, .....keeping it simple. 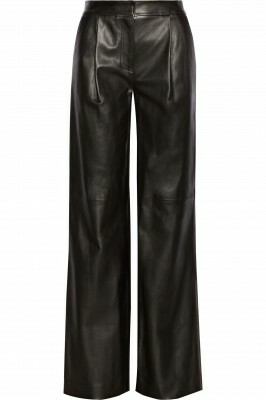 Other than my MAXMARA coat I am wearing Golden Goose sneakers, Chanel bag, Jitrois leather pants and North.dk T-shirt. Mix and match with leo print in your interior. Custom made chairs put in a "simple" environment, watch out and don´t overdo it ! Black is usually a color associated with mystique, something negativ and many times even something frightening and evil. But still it´s the most popular color around. It makes such a strong statement whether it´s in fashion, architecture or design. Using black adds a lot of character, but you need quit the psyche to surround yourself in it. Take a look and see just how great it is. Privat house with black exterior. It strengthen the look of the house. E-type Jaguar 4.2 .A dream ! Arne Jacobsen The ´7 special edition in black with black legs. So much more amazing than the traditional one with steel legs. Great mix of black and color in privat home. It gives a lot of character and collects the room. Black tiles and brass in bathroom. Uber cool ! Linnen in black from AIAYA. Sleep well IF you dare. Black Spinning light BH2 from &Tradition. Staircase in black lacquer finished with gold metal strip. A very exclusive look. Fridge from SMEG in black. Home wall in black marble. WAUW! Amazing kitchen in black lacquer. Specially when mixed with raw stone. Great contrast. Special edition EAMES chair in black and brass. I want ! 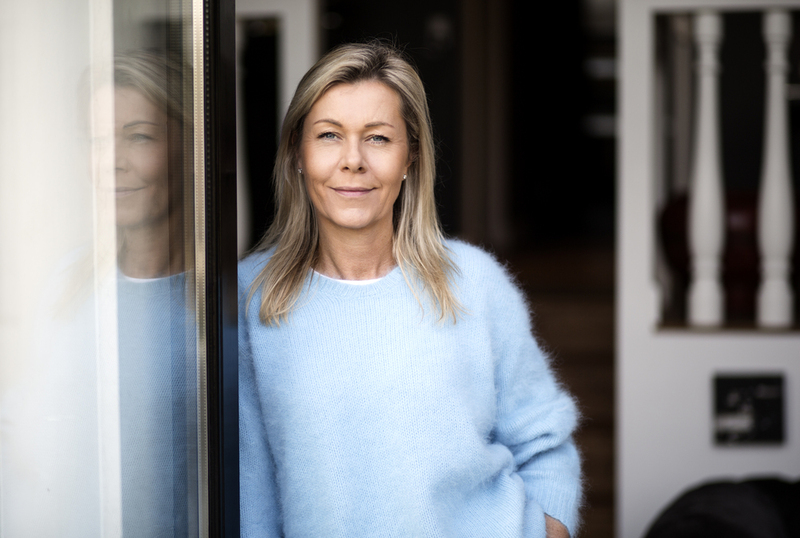 It´s impossible to mention black without showing my sisters swimsuit and lingerie brand North.dk which has got only things in black. And of course my black baby, Caesar. 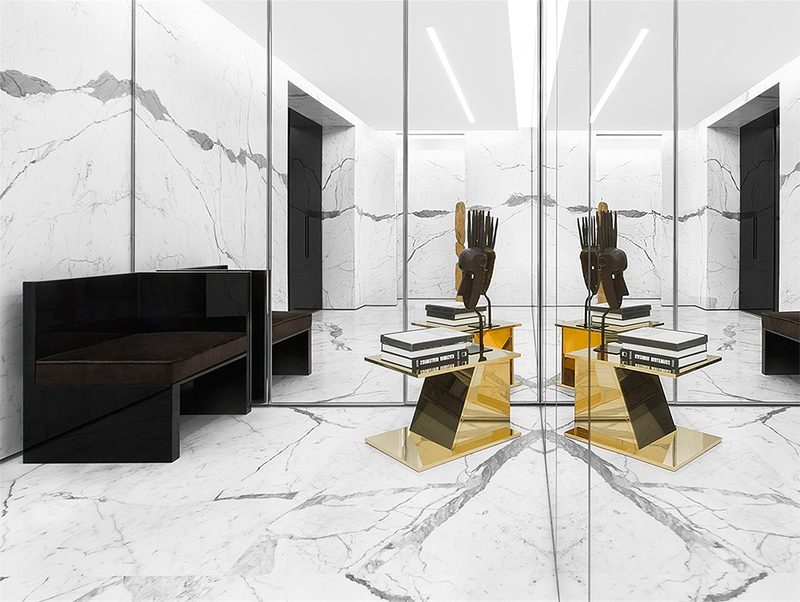 Its all about gold and marble at Saint Laurent´s, Paris. Something great to see next time you are in Paris. 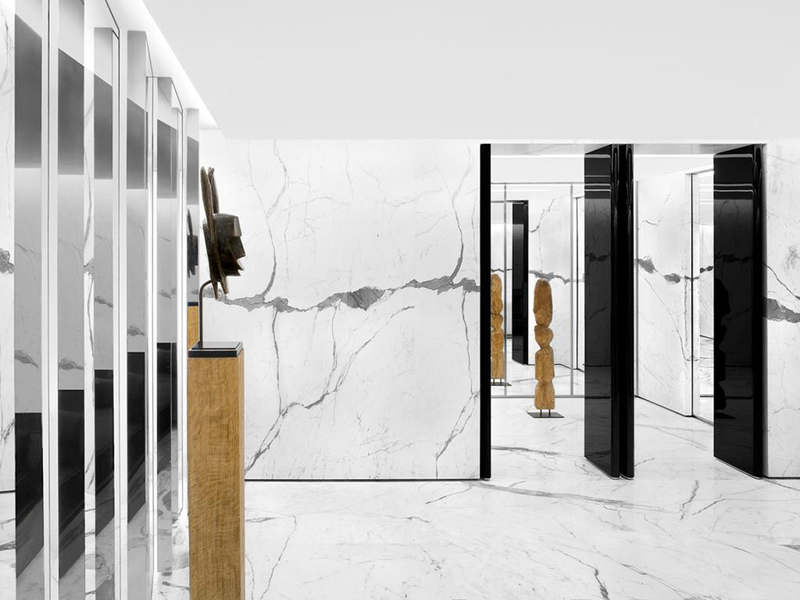 Saint Laurent reopens in Paris. 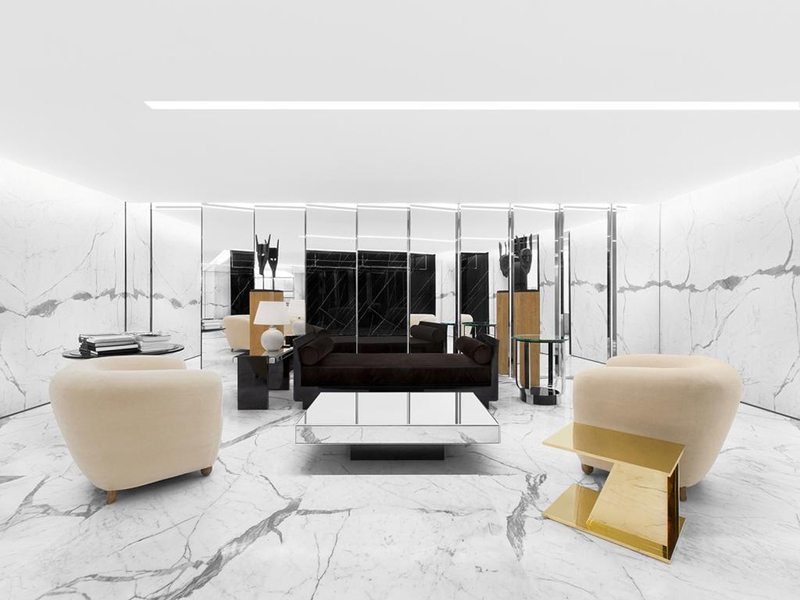 In years past, everybody fell in love with the sharp and sleek design of Saint Laurent’s pace on rue du Faubourg Saint-Honore in Paris. 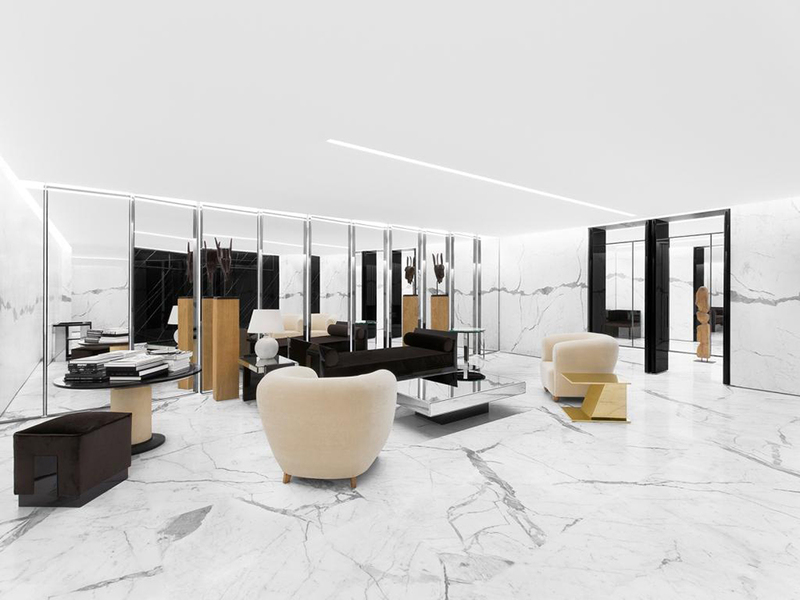 Outfitted in marble, complemented with mirror walls and glossy black interior accents, the space was a visual feast. 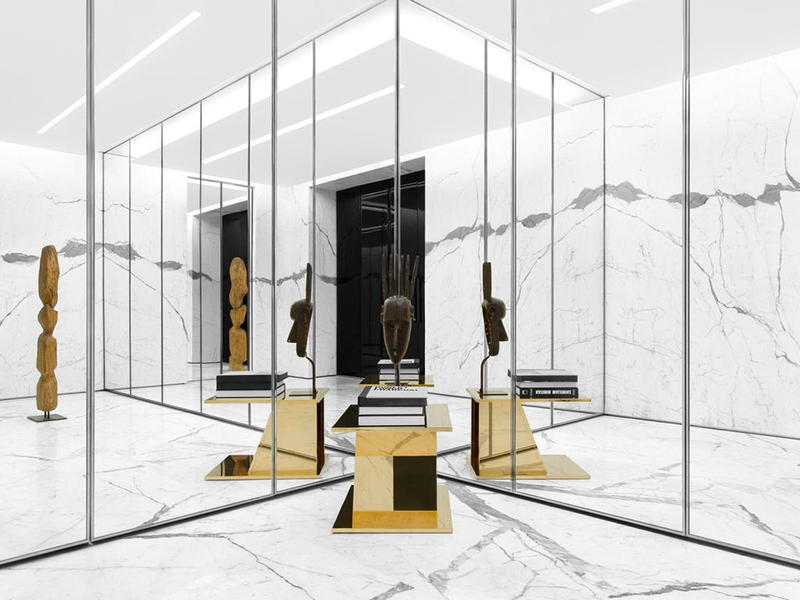 Today, the fashion label has re-opened the 390-square-meter retail charm with the addition of tribal sculptures, gold coffee tables and creamy velvet loungers. 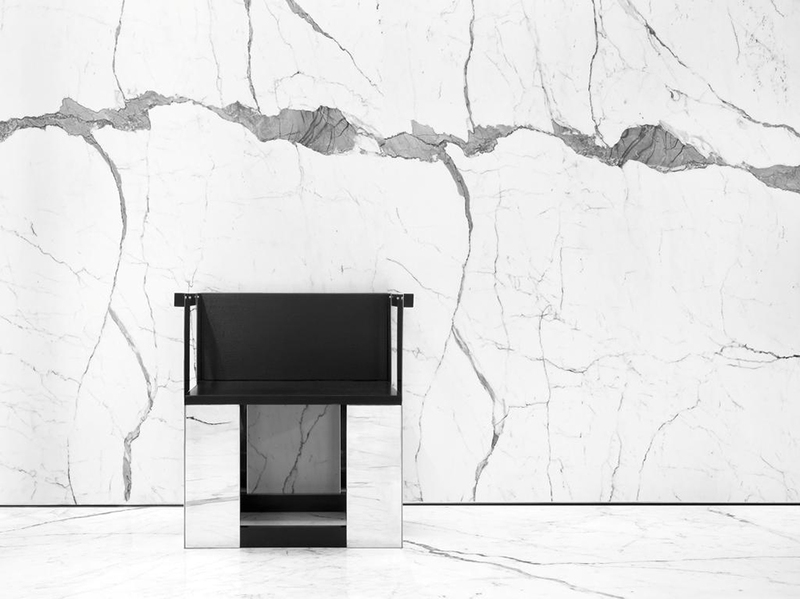 Designed by Hedi Slimane, French photographer, fashion designer and current creative director for Saint Laurent, the boutique features pieces by Jacques Adnet, Jean Besnard, Edith Borger, Théo Ruth, Jacques-Emile Ruhlmann by Alfred Porteneuve and André Sornay. This time around, the space is so much more than a visual feast. It’s a museum of sculpture and fashion, a true reflection of the brand’s timeless presence in the ever-changing fashion realm. If I could buy it all ...I would buy it all. Haider Ackermann is one of my absolut favorites. Look at those fabrics and the way everything is cut. NICE NICE NICE ! The dresses flows in an amazing way everytime you take a step. It is going to be difficult for me to get out of my black leather leggings, which I have been "living" in for the past 6 month. But if I mix it with white, creme or antique rose silk or other light fabric's, it makes me look less dressed for winter and gives me a soft transition to summer with a more positive and romantic spirit. Radio City Hall ´Radiohuset´ in Copenhagen was created by the Danish functionalist architect, Vilhelm Lauritzen, in the years from 1937-45. With help from his dear colleague, architect Finn Juhl who designed most of the furniture in the building. Being build during the war, with very few resources, Vilhelm Lauritzen found that instead of using rubber, he would use cheap soft Finnish birch mixed with teak, to create the right conditions for sound throughout the building. All wall´s are covered with maple, which over the years has turned reddish because of the exposure of the light. The building was conserved in 1994 for being a masterpiece of danish modernism. During ´Danish Fashion Week´14 ´ I was asked, by Goldmind, to be responsible for the interior for their ´Jewellery Room ´ event in the beautiful ceramic room which is located on the second floor of Radiohuset. Carl Hansen & Son was very kind to lend us their incredible classic designer furniture for the purpose. I love a good pair of shoes or even maybe 2....4, 5, 7 pair of shoes. I love shoes, specially a nice pump with a white t-shirt, a pair of jeans and a good bag, in a laid back way, but still hot. Valentines Day is over but Valentine is not. I love gadgets for my iphone and Mac. I swear to Apple, but I don´t really like the feel of the metal and to protect the object I always find covers for both my Mac and phone. Lately I am going crazy for Valentine Goods a NY based company, who in cooperation with 3M has developed these cover and back sticks, to protect and decorate you most needed carry around device. Tom ford´s new collection is great as ever, and reminds me of myself running around Milan feeling super trendy and hot in his patchwork jeans skirts he made for Gucci back in late ´90 ;-) Obviously now that would look a bit "funny" and I would prefer this collection anytime. My absolut favourite place in Tulum. Being on my first trip to Mexico, I have seen many nice places already in the few days we have been here, but best of all is definitely, Posada Margherita. An italian owned boutique hotel with fantastic food, the best fruit juices, amazing interior and uniq shopping. Really laid back, classy and with great atmosphere. I have always been a sucker for soft colours and soft materials. 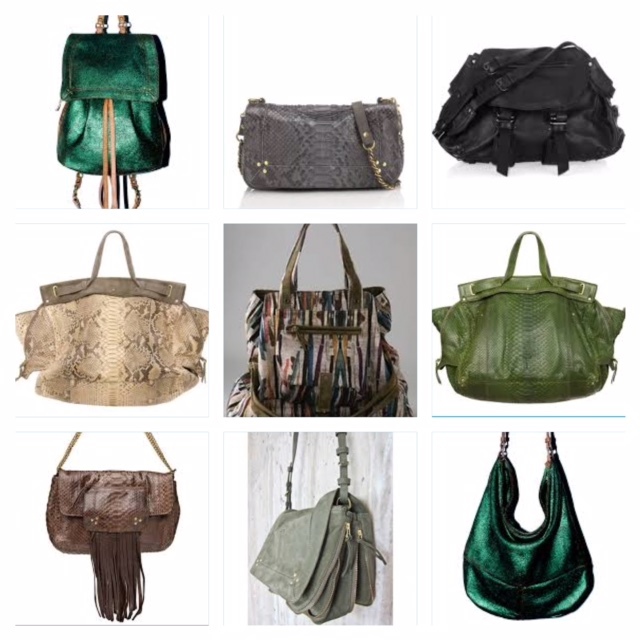 Soft colours and soft materials are great, whether it´s for summer or winter. In these day´s which are grey and sad, it helps to use other than black. The big sweathers, boot´s, scarf´s or even fur in soft colours can definitely brighten up your day and help you along in this dark time of the year. If you need help please contact me at CASA CHRISTINA. Le Cap Horn, the best maritime place in the mountains. My cool sister, Marie Louise, has been working long and hard to get her new site for North ready before X-mass, and she did! Check it out and shop for all your friends and family, to make sure they have great things waiting under the tree this year.